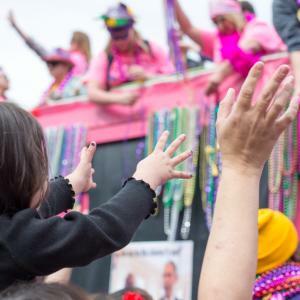 Mardi Gras in Louisiana is something everyone should experience in their lifetime and the Capital City offers one of the best places to celebrate the one-of-a-kind holiday. Mardi Gras isn’t just one day or about one parade, it’s a whole Carnival season! Once here and immersed in this unique tradition, you’ll find the positive energy infectious. Bring the whole gang to Baton Rouge for Mardi Gras! Whether you’re traveling with a group of friends looking to enjoy night parades and the nightlife of the city, or have made a family trip to spend Mardi Gras together and looking for casual day parades, there’s an experience for everyone. 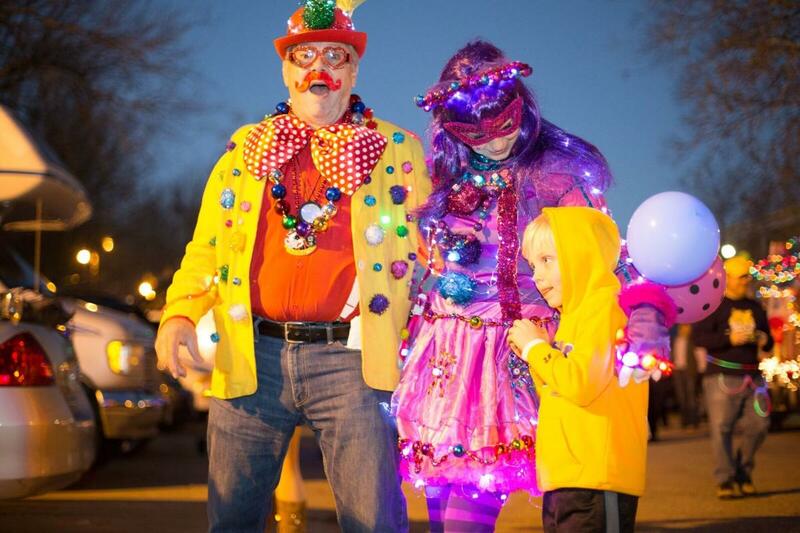 From local neighborhood parades to large Krewes that pass in front of our famous State Capital, the city boasts a full schedule of parades. There’s even a parade just for dogs that celebrates our favorite furry friends! 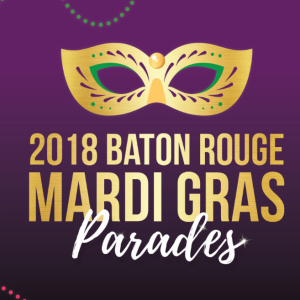 The inaugural Mid City Gras Parade rolls Sunday, February 4, 2018, at 1 p.m. The Baton Rouge area known as Mid City has experienced quite the renaissance lately, thanks to a boom in redevelopment and residents and tenants cultivating its vibrant art and culture. 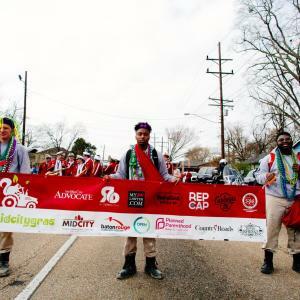 It’s a fun-loving community that’s sure to host a good time, evident in the parade’s wacky slogan “Wanna get nuts?” that embraces and celebrates the many squirrels that inhabit the beautiful shady trees of Mid City. “Mardi Gras” is French for “Fat Tuesday,” and down in Baton Rouge you’ll soon learn exactly why. 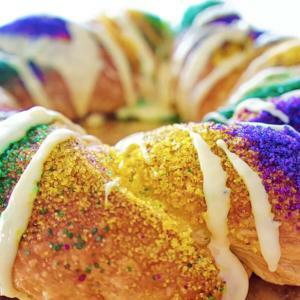 Held on the final day before the Lenten season begins, the name “Fat Tuesday” represents the stuffing of your face before one has to fast for the 40 days leading up to Easter. 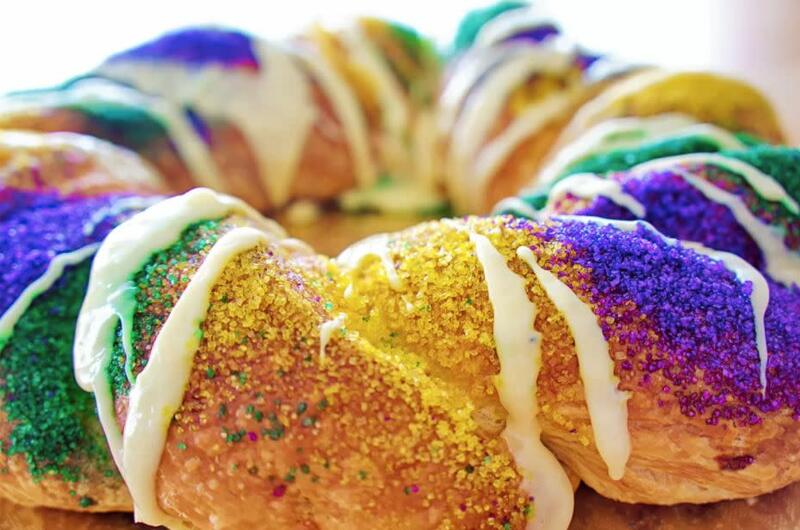 Thanks to the Capital City’s abundance of restaurants, food trucks, and bakeries whipping out countless King Cakes, stuffing your face is highly likely and highly recommended. Believe us when we say that you’ll look out of place if you’re dressed normally during Mardi Gras. 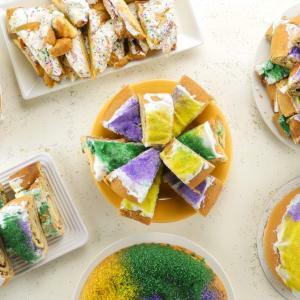 Traditional Mardi Gras attire incorporates the holiday’s colors of purple, green and gold and expect everyone to be wearing it from head to toe. From costumes, to tutus and headwear, have fun with it and get dressed up! 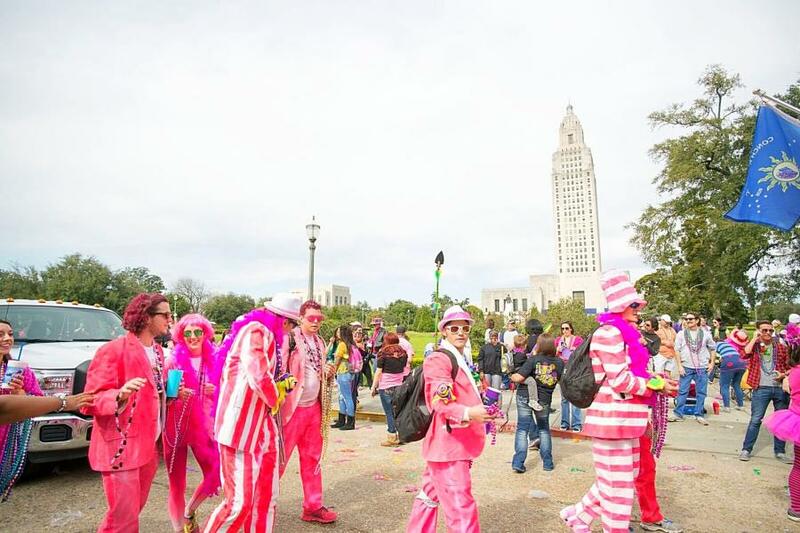 Some parades have specific themes you can incorporate into your garb, such as the annual Spanish Town parade when Baton Rouge becomes a sea of pink in honor of the neighborhood’s infamous flamingo heritage. More than just beads! 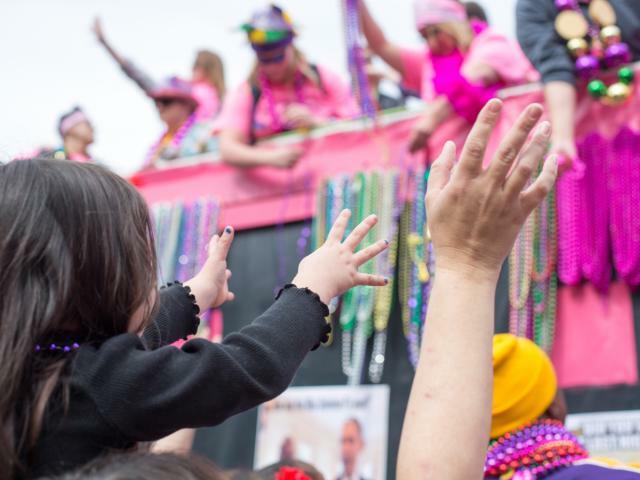 When it comes to beads, the bigger the better, but most parade-goers save their “Throw me something misters!” for items like plush toys, feather boas, moon pies, doubloons and for night parades – light up throws! Be sure to bring a tote or other bag to fill to the brim. Traveling on or don’t want to keep all your plunder? Save and donate your beads and other throws to Krewes for next year! The thrill is in the fun of the catch, and you’re sure to catch a good time in Baton Rouge for Mardi Gras. 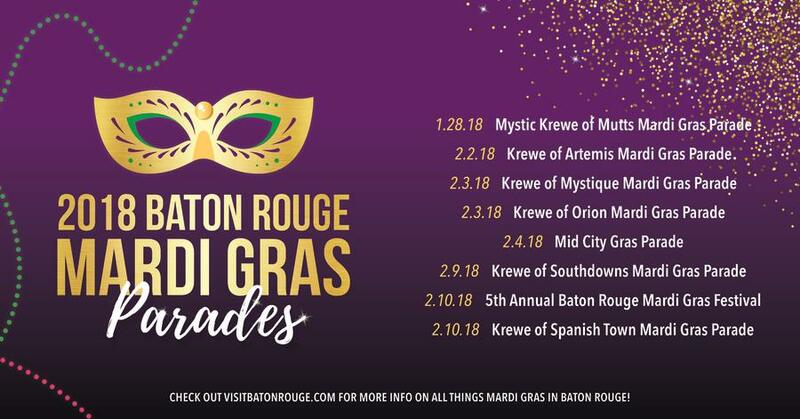 Thinking you don’t want to miss out on Mardi Gras in Baton Rouge? There’s still time to make your carnival plans! Hotel rooms are still available, some even right on parade routes! 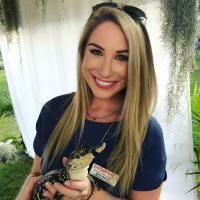 Explore other things to do in Baton Rouge during Mardi Gras, because the fun doesn’t stop once the street sweepers come out.